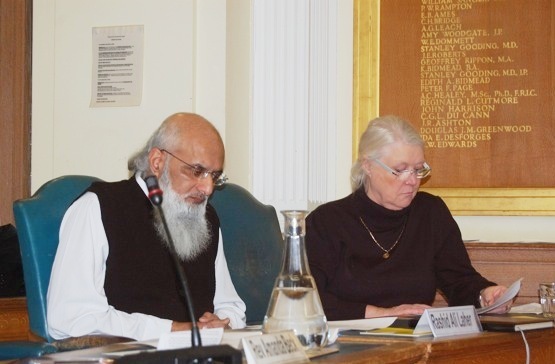 Inter-faith Forums / Faithfull Friends events, kindly circulated by Rashid Ali Laher (above left – Kingston IF Forum, Richmond IF Forum and South London Inter Faith Group). Download full details here. Saturday 11 October 2pm Britain has a proud tradition of providing sanctuary to those fleeing persecution, and civil society has been at the forefront in welcoming and supporting refugees. Meet at All Saints Church Kingston. Walk with Sukkah, a ceremonial tent to mark the Jewish festival of Sukkot ~ highlighting the need to resettle refugees in communities not camps ~ details http://www.unhcr.org/542abbc16.html. Saturday 18 October ~ 1830 hrs Annual Gala Evening, Claremont Fan Court School, ESHER – an evening of “Foods & Performances” from diverse cultures. www.elmbridgemultifaith.org.uk Contact GeoffreyMorriss@emas-bc.co.uk 01932 868454. LAST THURSDAY most months (30 OCT, 27 NOV & 18 DEC) ~ Open Lunch Time Meetings South London Inter Faith Group at Streatham Friends Meeting House, Redlands Way, SW2 3LU. Vegetarian Lunch 12.30pm followed at 1pm to 2pm ~ an opportunity to share Inter Faith news and experiences, and to discuss matters of concern to SLIFG. Contact Reverend Alan Gadd ~ membership@southlondoninterfaith.org.uk. Islington Faiths Forum is holding a best practice conference on Wednesday 26 March 9.30am – 3.30pm at Islington Town Hall. The topic is one which affects many in our communities: mental health and poverty. The day will be practical, informative and inspiring. 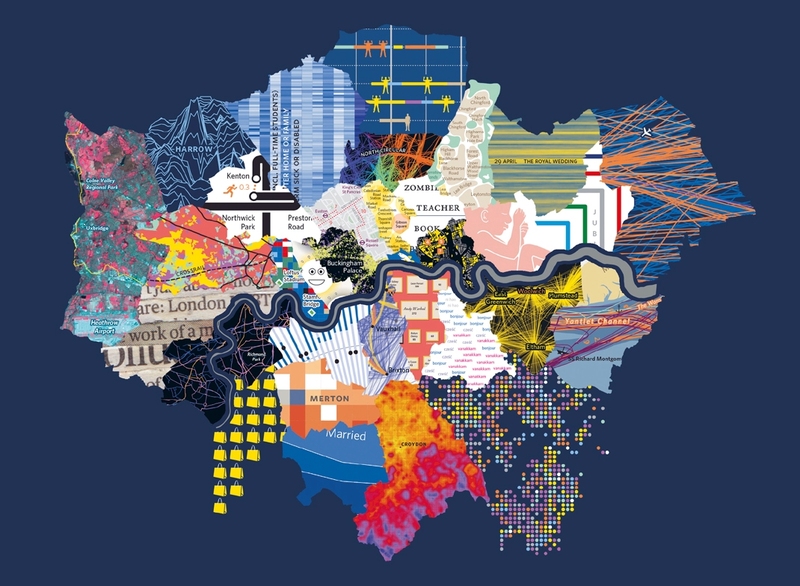 If you are interested in developing and supporting work in your own borough on poverty and mental health, IFF would be happy to hear from you. IFF’s events always bring a wide range of people together from local religious communities, from public agencies and from academic and research bodies. Participation is free and lunch is included. Download the programme and flyer to pass on to your networks and apply to Roz Miller rosalind.miller8@btinternet.com if you would like to attend. Roz will also be saying a few words at our next LBFN meeting on 11 March. 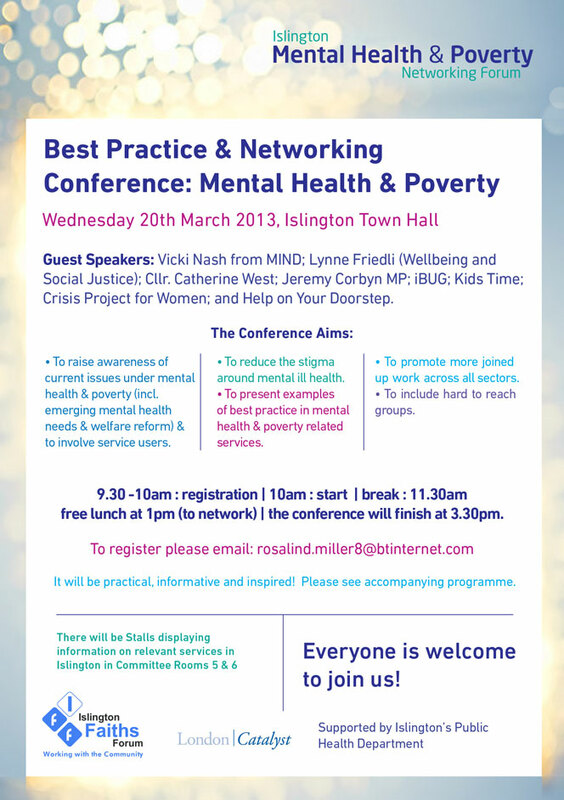 Islington Faiths Forum is working with Islington Public Health and London Catalyst and invites us all to this excellent event on Wednesday 20th March 9.30am – 3.30pm entitled Best Pratice and Networking Conference: Mental Health and Poverty. Details are on the flyer above and programme, which is downloadable from the IFF website. Contact Roz Miller if you would like to attend. Are you interested in exchanges and visits with intercultural groups across Europe 2013-14? 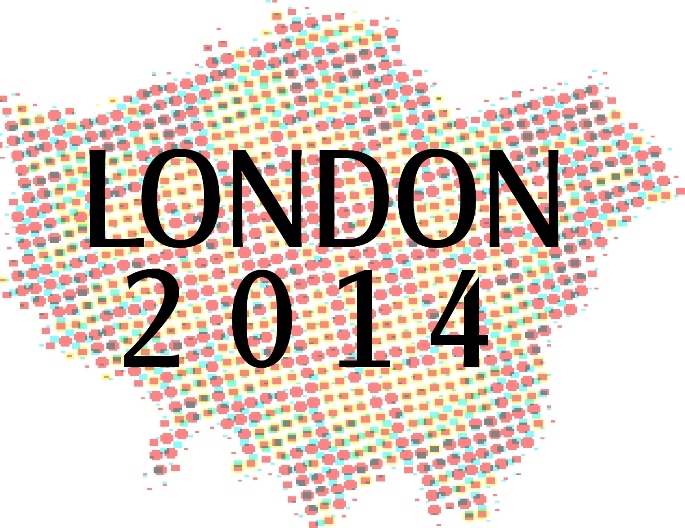 The ENORB meeting next month (13-14 November) will be looking at proposals and ideas, so make sure yours are included! LBFN will be leading this workshop – so let me know if you cannot attend but would like to explore exchange possibilities. The main topic of the meeting is the economic crisis in Europe. Excellent speakers with grassroots experience and economic expertise will lead a roundtable discussion. The event is free (contributions towards meals welcome). Register at Eventbrite to secure your place. The last seminar was very popular, with an impressive turnout from London, so early booking is recommended. Download the programme and invitation. Eurostar is usually the cheapest way for individuals to travel to Brussels. Simple accommodation at ICA (around €50) is first-come, first-served, so please let me know if you would like to book a room. Guest post: How much change can you get from £1? A warm welcome to Charlotte Dando, who’s been working with local religious leaders in London – see if you recognise any faces in the film! Over to Charlotte ..
How much change can you get from £1? That’s the question we’ve been asking faith communities throughout London. Congregations, interfaith groups and individuals of faith are being challenged to sign-up for the Live Below the Line campaign and manage on just £1 of food and drink per day for 5 days to raise funds and awareness of the 1.4 billion people around the world who live below the poverty line every day. 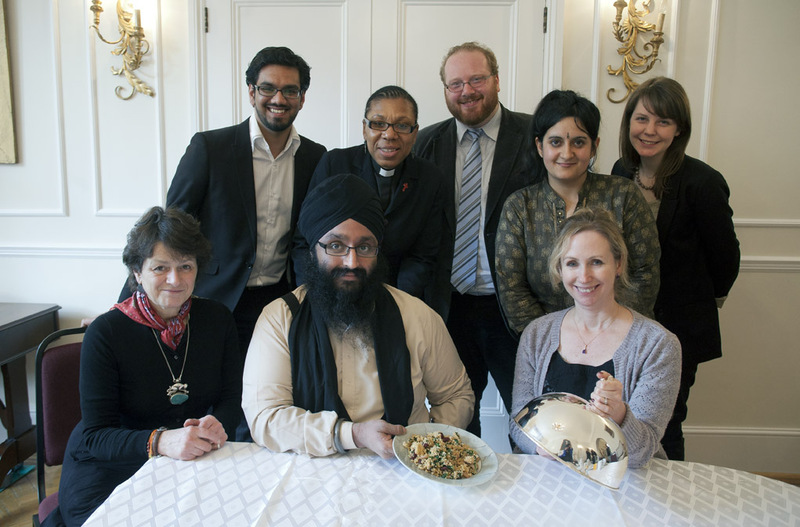 As a Faiths Act Fellow on a yearlong multifaith social action programme at the Battersea based charity Malaria No More UK, together with my partner Fellow Usman Nawaz, we recently cooked up a low budget lunch and served it to guests from seven different faith traditions. The lunch was held at the National Bahá’í Centre in Knightsbridge and guests included Rev. Rosemarie Mallett of St. John’s Angell Town in Brixton, Chazzan Jermey Burko from New North London Synagogue and Sheena Napier, of the London Buddhist Vihara. Watch the interfaith discussion on faith, food, poverty and malaria and learn more about this multifaith campaign. Contact charlotte.dando@malarianomore.org.uk for more information.